One of the popular messaging platforms the Facebook Messenger will now allow users to play games with contacts, as the social media giant Facebook announced on its own blog known as Newsroom, that the Facebook Messenger will now offer built-in games. The social media giant Facebook needs to be reconciled with users after the controversy generated by some measures that endanger privacy. A clear example is the case of data exchange with WhatsApp, something that the social media giant Facebook has had to throw in the sheet after the flood of complaints and investigations by various regulatory institutions. A few days ago we told that the social media giant Facebook owner Mark Zuckerberg may have developed a tool “censorship” for its platform in China, a new movement of the company is not exempt from criticism, as it is logical. So the experienced social network Facebook which is also the most used in the world seeks to promote the use of its services through new features. As we all know that the Facebook Messenger is one of the popular messaging platforms today and with over one billion active monthly users, the Facebook Messenger now allows users to play games with contacts. 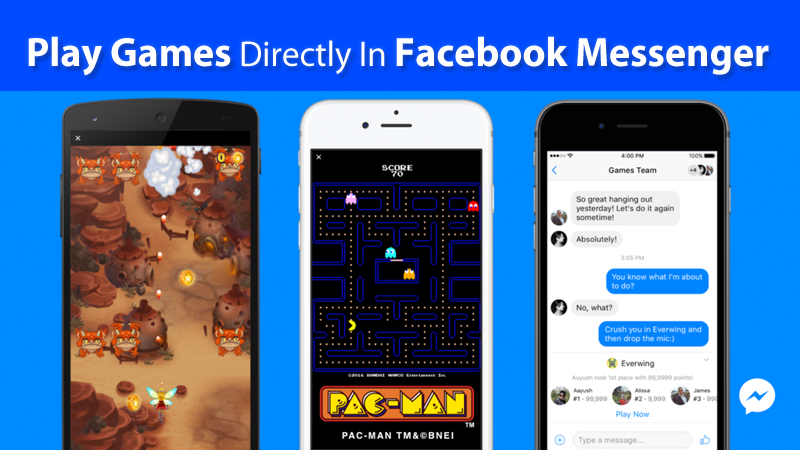 Yes, the social media giant Facebook announced on its blog known as Newsroom, that the Facebook Messenger will now offer built-in games and this feature is known as the “Instant Games”. However, the options offered by Facebook Messenger with the arrival of games are interesting, yes, now you all might be thinking that ‘HOW’? As the users can simply challenge their contacts without having to exit the application. So, you can see their scores on tables, in addition to converse while playing with your contacts, group or individual chats. To enjoy the classic games that Facebook has released for Messenger, you only need to update the app to the latest version. Once done, you will see a specific icon for games at the lower area of the chat. While the undisputed leader in the field of instant messaging is WhatsApp, which far exceeds the one billion users, Facebook Messenger is experiencing a remarkable growth and is positioning itself as a serious rival.